When I was at the final days of pre-baiting the sparrow trap, I was thinking "Fiesta time is over". The "free bait" was just pre-bait and now it's time to see the homemade sparrow trap in action - and catch a few sparrows. Well, after I finally set the trap, I got a surprise the following morning. As dawn was breaking, I went outside and noticed some movement in the bird trap as I looked up. Going nearer, I saw the silhouette of a head-like figure that seemed to be staring at me. Finally, the trapped worked! But I really doubted it to be a sparrow. My observation from the pre-baiting period was that sparrows don't feed before dawn. And then the outline of the ears became clearer. It was a rat! And so I climbed the ladder to see the occupant. It made a lot of ruckus upon seeing me. Well at least I caught something. It wasn't all that bad. I just didn't realize there was a rat problem in our garden. Maybe it was the smell of the cookie and cracker crumbs that enticed the rat. With all the rat droppings on the landing board, I concluded that it's been there for a while. Now, how to dispose it? It took me quite a while to figure out a practical way to dispose of it - dead. I thought of drowning it. I could dunk the trap in a pail of water. But then the trap was too big to fit in any pail. Besides the rat would just go up the cage to avoid the water. And then I thought of dropping just the rat in a tall pail of water. I put around six inches of water inside the pail. 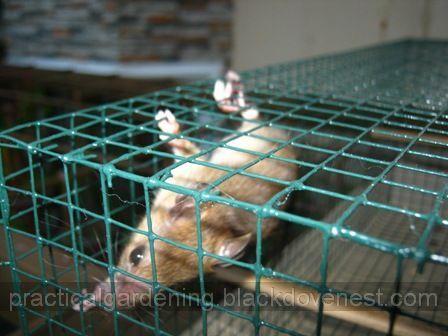 I opened the access door of the trap and positioned the access hole above the pail. The rat went to all directions except fall into the access hole. It was too clever for that. The rat may be clever but it wasn't strong enough to cling on to the cage. 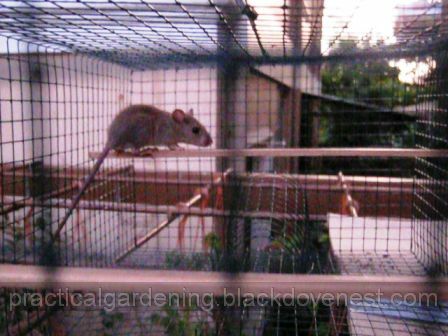 I shook the cage violently until the rat lost its grip on to the screen wires and promptly fell through the access hole and into the tall pail. The rat just floated and swam nicely inside the pail with water. It attempted to jump out several times but the pail was just too tall for it. The rat just fell back into the water because the inside of the pail was too slippery. I took a bamboo stick and attempted to push it down and drown it. Well, it took a hold of the bamboo stick and started to climb on the stick I was holding! Fortunately, I was able to shake the stick hard enough for it to fall back into the water. Then I got a two-inch thick pvc pipe. The diameter of the pipe was big enough to stomp down on the rat and keep it underwater. I just had to be careful that the rat does not climb on to the pipe for a quick escape. As I pushed it down to the bottom of the pail to press and keep it submerged, there was a violent but brief struggle. In less than a minute, the rat had drowned. i tried it and i catches at least 12 sparrow and two black colored bird with same size. wonderful, well that a span of 1 month and 2 weeks.